This circuit was devised to switch power to a Peltier cooler in a vehicle. Power to the load from the vehicle’s battery is switched by a SPDT relay while the ignition switch is turned on and from the SLA auxiliary battery when the ignition is off. The SLA battery is charged from the vehicle’s battery. When the engine is running, the voltage remains fairly constant, which greatly simplifies the charging circuit. If the SLA battery is fully charged, any further charging current from the vehicle battery is limited by a 3.3W 5W resistor (R1). If the SLA battery is deeply discharged, the voltage drop across this resistor will be enough to bias on PNP transistor Q1. This will turn on P-channel Mosfet Q2 and it will provide further charging current via R2, effectively becoming a 2-step charger. Since the paralleled resistors (R1 & R2) have a lower combined voltage drop, Q1 will receive lower base bias, which in turn will cause Mosfet Q2 to fully saturate. This positive feedback creates a clean transition between the two states and prevents Q2 from over-dissipating by being partially on. The current then will ramp down until the battery is only receiving a trickle charge and the voltage drop across the paralleled resistors is only a few dozen millivolts. Schottky diode D1 prevents the SLA battery from discharging into the vehicle’s accessory circuits when the engine is off. Two safety devices are included in the circuit, the first being in-line fuse F1 which will prevent serious damage in case of shorts. In addition, a PTC resettable thermistor (RT1) protects the battery from sustained over-currents during the charging phase. It is a 1.85A hold, 3.70A trip device at 23°C. Since it has a positive temperature coefficient, at 70°C, these ratings decrease to 1A and 2A for hold and trip respectively, which can further protect the battery. Lastly, to protect the SLA battery from deep discharge, a low voltage disconnect is included. This is centred around REG1, a voltage reference configured as a comparator. Its reference (REF) input is connected to a voltage divider, as long as "enable" switch S1 is closed. Whenever the voltage at REG1’s reference terminal exceeds 2.5V, its anode will be pulled low, biasing on PNP transistor Q3. Q3 provides positive feedback via the 270kΩ resistor and diode D2 to turn on N-channel Mosfet Q4, which allows the load to be powered up. If the SLA battery voltage drops below 10V, the reference terminal will fall below 2.5V and the anode of REG1 will go high, thereby removing bias from Q3 and turning off Q4 to disconnect the load and prevent deep discharge. 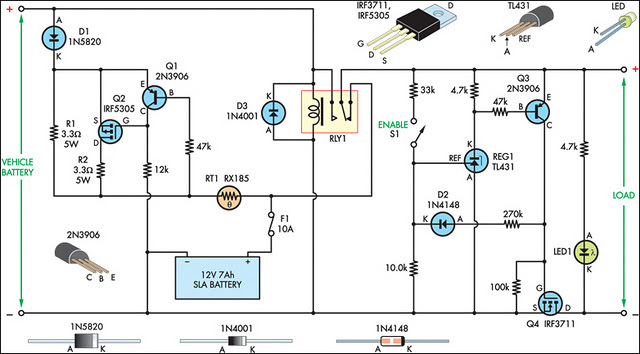 LED1 indicates when power is being applied to the load.